The Taoists have a famous teaching about an empty boat. You are in the middle of a river when an empty boat rams your boat. Chances are you would not get angry at the empty boat but…. …..if someone was in the boat it would be a whole different story. You might become enraged at the person in the boat holding onto the rudder. 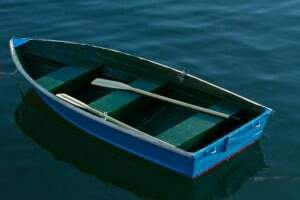 The point of the story is that the person that cuts you off in traffic, the kids that bullied you as a child, the negative and hurtful comments someone has made about you are all empty, rudderless boats. They have no other choice but to act as they did because of their own unexamined wounds, and they did not know what they were doing and had little control over it. People who are not kind have no control of their actions and are unconsciously driven by their pain. You have to think of your dog the same way. Your dog is basically an empty boat when he comes into your home. Dogs will do normal, natural canine behaviors that they have no control over. Instead of being driven by pain they are driven by instincts, drives and behaviors they learned in the litter (a dog driven by pain will probably be aggressive). A puppy biting you, peeing and pooping on the floor, stealing food off the counter and chewing your antique oak furniture is normal. Getting mad at the puppy is like getting mad at an empty boat. I see people getting mad all the time at their little empty boats and think resorting to punishment is the answer. Yes, Grasshopper. The answer to your dog’s “behavior” problems can be taken care of with the M.U.T.T. Method which was developed by a highly intelligent, extremely skilled, shockingly handsome canine specialist. M – Manage your dog’s behavior. Management of behavior is important and will help you when you are frustrated or can’t watch your dog. U – Underlying behavior. What is the reason for the behavior? Once you understand WHY your dog is doing a certain behavior you can take steps to change it. T – Train a new or different behavior. If your dog jumps you can apply the techniques I show in the Good K9 Manners Program and teach your dog to sit politely. T – Time. Changing behaviors sometimes happens fast. Other times it might take a little while.